The Indian auto-giant, Mahindra, which has made its first electric vehicle, Mahindra e2o launched it in the Nepali market recently. It is a zero emission car, which gives a very smooth driving experience on the road. There are a lot of good features of this vehicle and in this respect the most relieving and interesting feature is its way of utilising and charging facilities. If we charge it through the 15 ampere of plug point, it is capable to drive at least 100 km. The company has given the Mahindra e2o price tag of Rs. 13.72 lakh (Ex-showroom, Nepal), which is very affordable and attractive too. The Mahindra cars have given this small and simple hatchback a powerful three phase induction motor and it has a capability to displace 3cc of engine. The engine churn out a maximum power output of 25.5bhp at 3750rpm and at the same time, a maximum torque generated from the engine is 53Nm at 3400 rpm. The company has given this a lithium ion battery and the capacity of this battery is to drive around 100 km without charging. On the other hand, when we drive it in the air- conditioned cabin, it is capable to drive only approx 85 km, which is not excellent but good enough. The company has made the Mahindra e2o features quite impressive. It is a four seater vehicle with a comfortable seating capacity and the head-room and knee room are very specious and passengers feel very happy while seating inside the cabin. The vehicle is loaded with a powerful air conditioner and this can be operate from the remote. The digital driving system makes the hatchback amazingly impressive. This stylish and small hatchback has an audio mounted control on its power steering wheel, which makes it very comfortable. The accessories in the car is very luxurious and in this respect 6.2 inch of navigation screen, makes it more wonderful. Apart from these, it has a lot of safety features, which makes the driving safe and the list includes power door locking system, power windows and many other such aspects. The exterior of the hatchback is quite good with its radiator grille, body coloured bumper, outside rear view mirror, head lights and many other features, which makes it impressive. It has also alloy wheels, which is covered with radial tires. 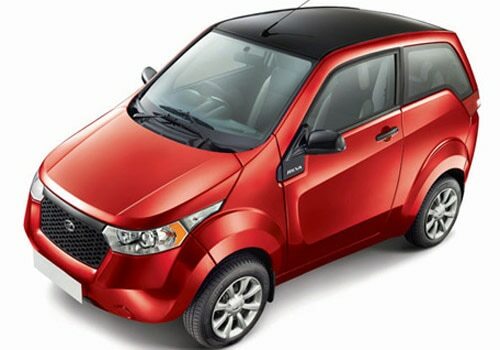 The Mahindra e2o pictures are available on various websites and in all those pictures the car look captivating. The company has made this car with a lot of sparkling and exciting exterior pain options and mahindra to roll out more affordable XUV500 in the indian market.